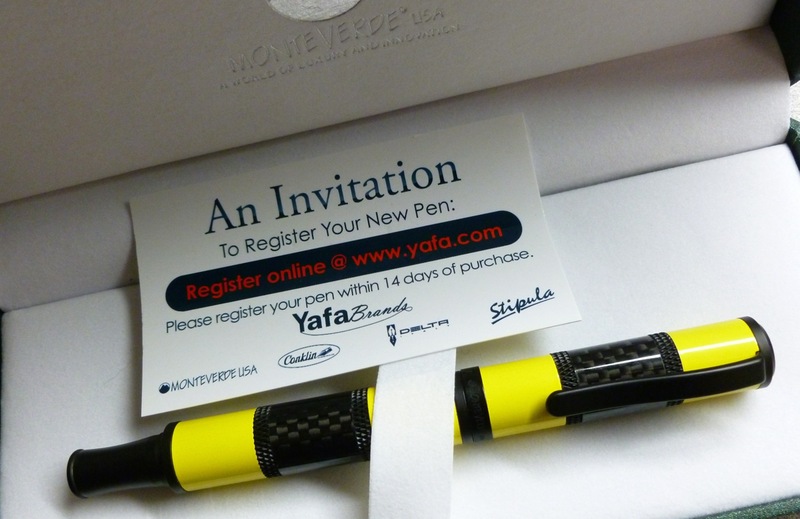 The fine folks at Pen Chalet sent along a Monteverde Regatta fountain pen for review purposes. I was not, and will not be, otherwise compensated. This review reflects my own experiences, observations, and opinions. We happen to live fairly close to the Erie Canal so in the summer Lock 20 is a favorite hang-out. If our timing is right, we can see everything from small motorboats to celebrity-worthy yachts to large and small sailboats. No matter the size, sailboats always fascinate me— all those ropes and masts and sails look like a recipe for a supremely tangled mess. Which is why I’m the landlubber and they’re the sailors. 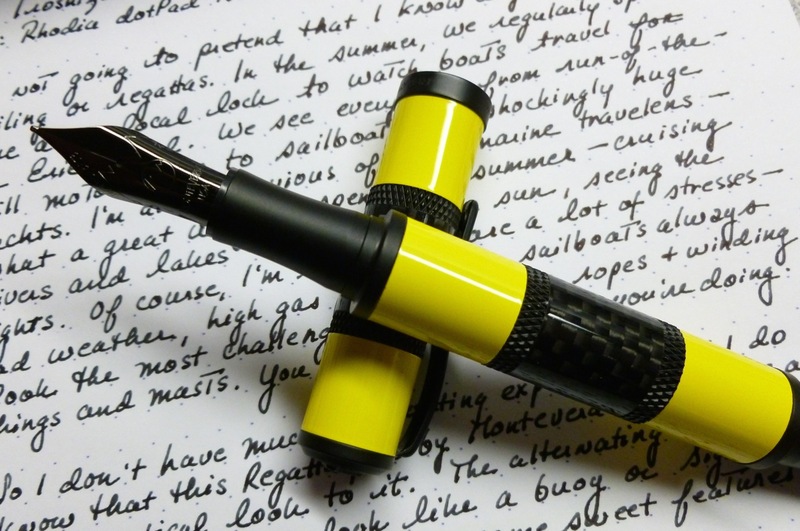 Despite my lack of boating experience (unless eating “Chips Ahoy!” cookies counts), I can appreciate the decidedly nautical looks of Monteverde’s Regatta fountain pen. With alternating bands of carbon fiber and yellow resin, the Regatta sports a look that calls to mind the colorful signal flags used during sailing competitions. 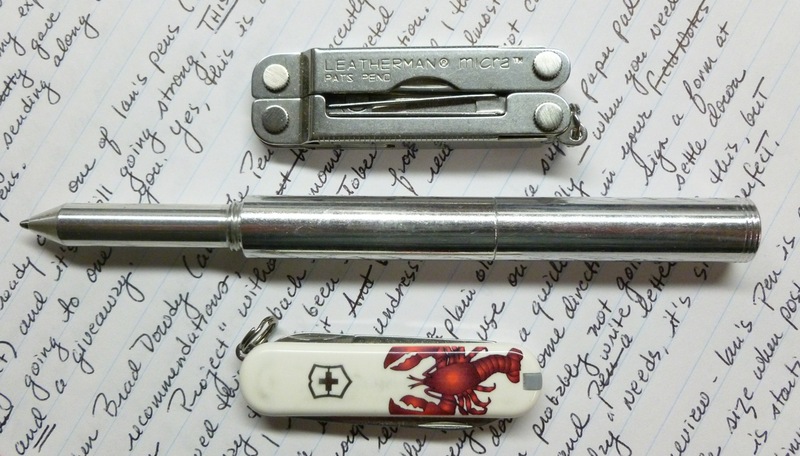 The Regatta checks a number of boxes on my “what I love in a pen” list. Box #1— carbon fiber. Though difficult to capture with my camera, the two carbon fiber bands (one on the cap and one on the body) are smooth and glossy— almost holographic in looks. Really sharp. Really classy. The carbon fiber bands are bordered by knurled accent rings, which checks Box #2— knurling. 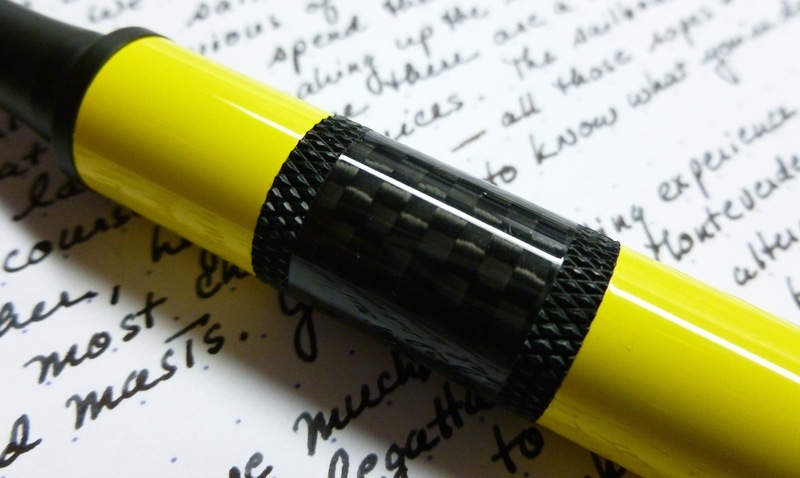 Usually you’ll see knurling in the grip area of a pen, but using the knurled rings between the carbon fiber and resin bands is a cool looking detail. What else do I love in a pen? A magnetic cap, and the Regatta has an excellent one. The base of the cap is lined with a strong magnet that makes capping, uncapping, and posting an easy and satisfying experience. CLICK! Capped. CLICK! Posted. This is not a wimpy magnet. Your ears will tell you that. Box #3— magnetic cap. Check. At 50 grams (32 g body, 18 g cap), this is a heavy pen. (Don’t drop it overboard!) Posted, I find the weight shifts a little bit too much to the back of the pen. I do sometimes write with it this way, but I don’t recommend it for long sessions. 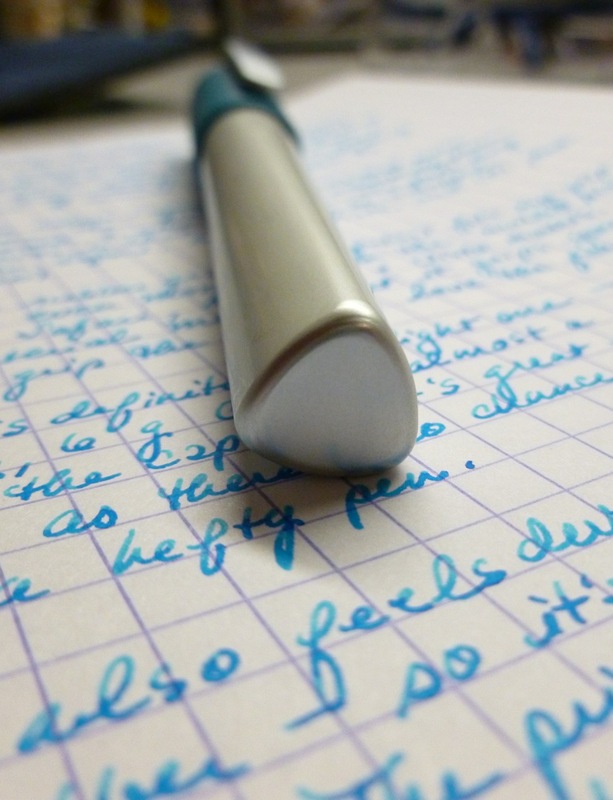 Typically, I use the pen unposted and find it well-balanced and easy to use for letter and journal writing. There’s still a nice heft, but nothing that’s too hard to handle. There is a bit of a step down from the body to the section that could interfere if you tend to grip your pens on the high side. For me, it’s not an issue, and I find the tapered grip to be comfortable. 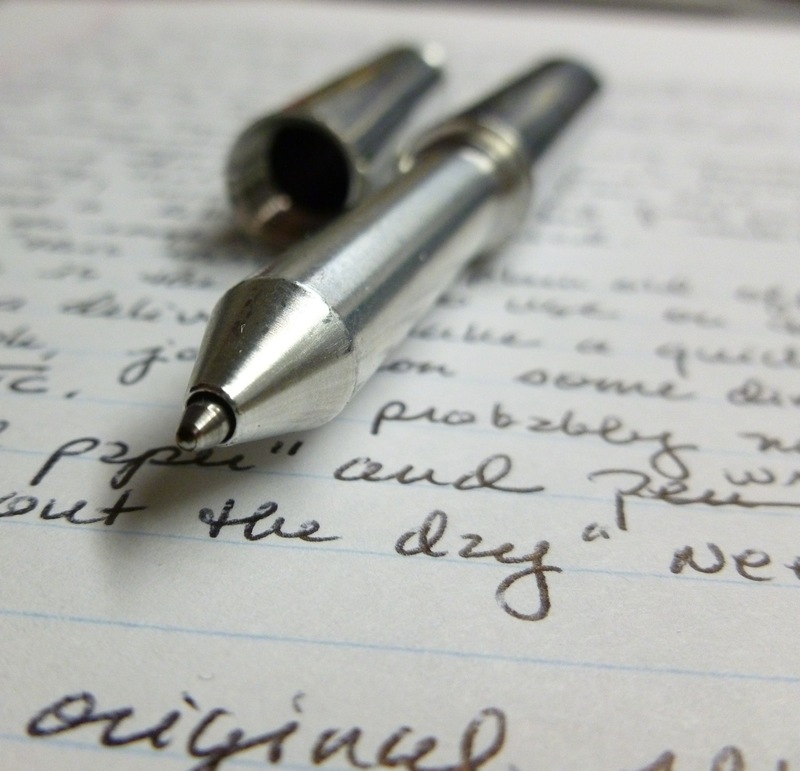 Unposted, the pen is comparable in length to a Retro 1951 Tornado rollerball, so if you’re used to writing with one of those, you’ll know that writing with an unposted Regatta won’t be a problem. The black steel nib (medium, in this case) completes the look. This one is smooth and wet. Every now and then, at the beginning of a writing session I’ll experience a hint of a hard start, but once it gets going, it’s excellent. Monteverde nibs are quite easy to swap which means that you can have one pen and multiple nibs for different writing experiences. I happen to have a 1.1 mm black stub on hand that I’ll swap in in the future. I love when a nib swap isn’t a federal case, and that’s true for this pen. 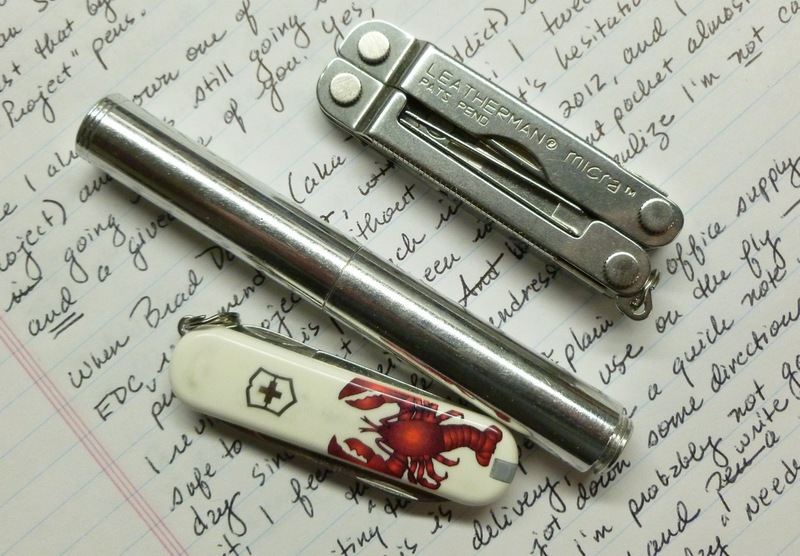 The Regatta is a cartridge/converter pen, with the converter included. I’ve loaded it with Iroshizuku take-sumi for this review because Pilot’s black is a perfect match for the carbon fiber, knurled accents, and stealthy nib. Personally, I love this particular color combination. 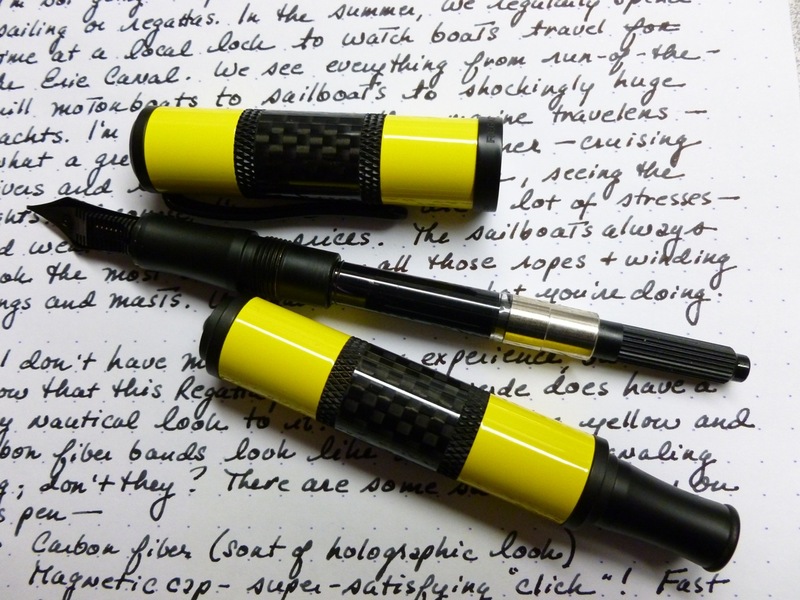 One meaning of a yellow and black signal flag is “I want to communicate with you.” What a perfect message for this pen. 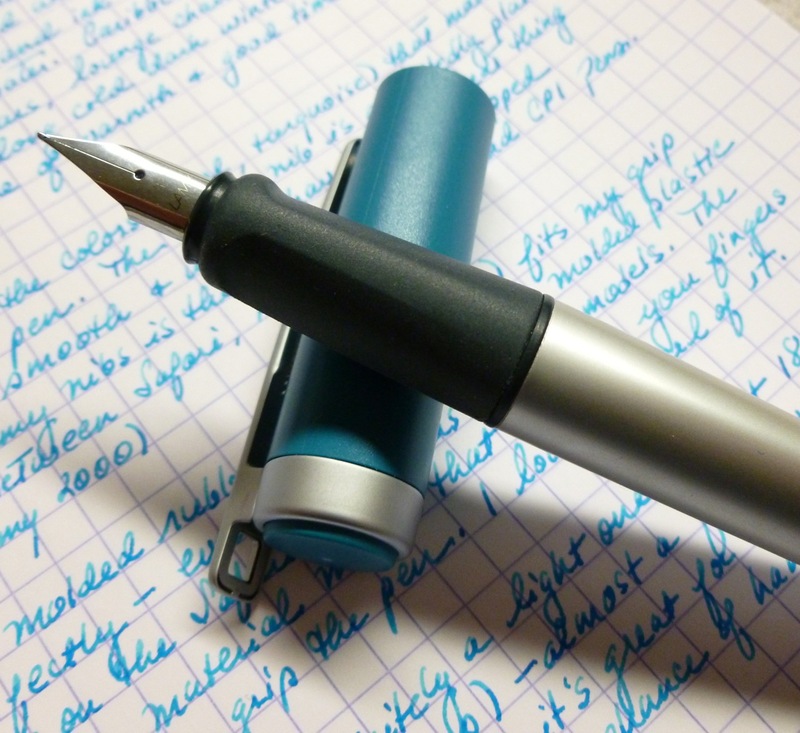 The Monteverde Regatta fountain pen is available from Pen Chalet for $100. Shipping is free on orders over $50. Use the code PENCUP for 10% off any purchase. Thank you to Pen Chalet for providing this pen for review. Feeling lucky? Pen Chalet “Pen Cash” giveaway is back! Enter to win 1 of 2 gift cards redeemable for any item on penchalet.com including fountain pens, ballpoint pens, inks, refills and more. The first place winner will receive a $50 “Pen Cash” Card, second place winner a $25 gift card. Both gift cards are redeemable at www.penchalet.com and can be used to buy something for yourself or you may give them away as gifts. Click HERE to enter! 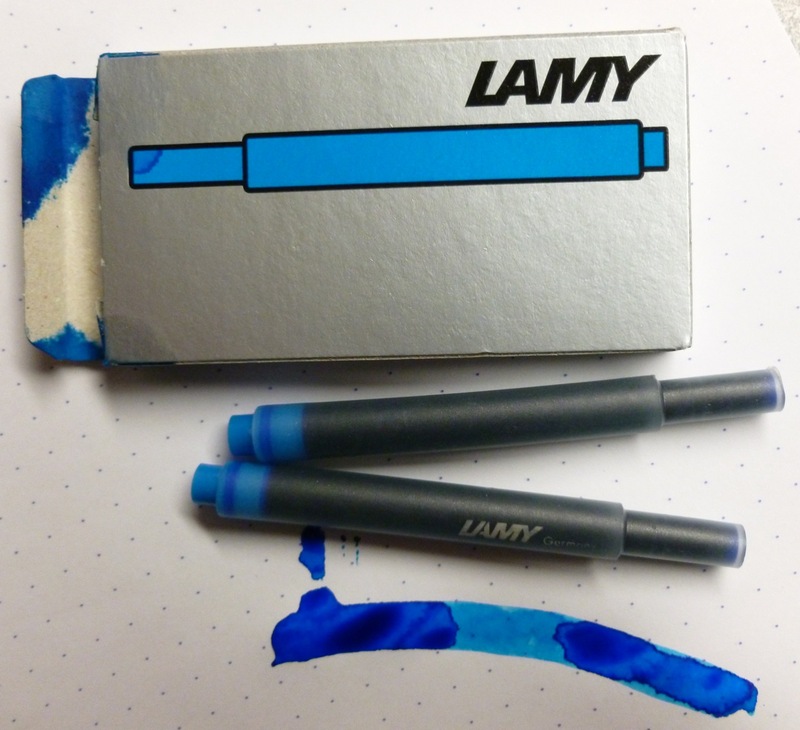 My friend Elaine, at JetPens, sent along a Lamy Nexx Opal and Lamy Turquoise ink cartridges for review purposes. I was not, and will not be, otherwise compensated. This review reflects my own experiences, observations, and opinions. So we’re officially sick of winter. The freezing temperatures recently caused a sprinkler head to burst in an atrium at work causing it to dump 65 gallons of water per minute before it was turned off. (Fun day.) We’ve had ice and ice pellets and a heap of slushy snow. Then bitter cold. Then more cold. We’re done. Well, I am, anyway. The students are on Spring Break for two weeks, but I’m not. I’m seriously craving a getaway to a warmer climate, a poolside chaise lounge with a good book, and maybe a swim-up bar. And sun-warmed crystal clear blue water. Maybe I’ve gone off the deep end, but that’s what this pen and ink combination reminds me of— a sun-drenched beach with turquoise waters like the ones in Tahiti or The Maldives. The color of this perfectly paired Lamy Nexx fountain pen and turquoise ink is a cheerful, tropical blue— just the thing for someone who’s wearing fingerless mittens INSIDE THE HOUSE. But it’s not just the color that makes this a fun pen. 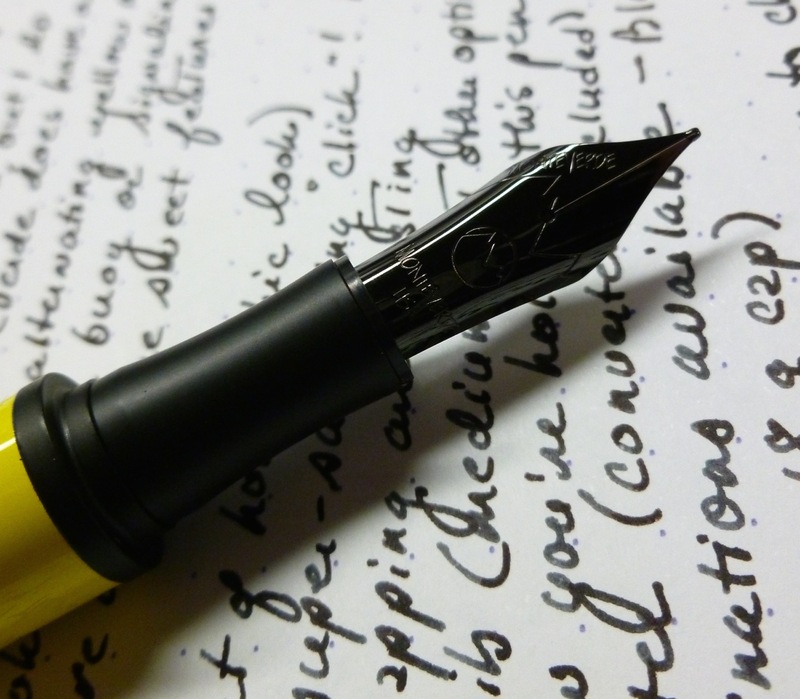 The fine nib is admittedly plain, but is notably smooth making it a true pleasure to write with. The great thing about Lamy nibs is that they can be easily swapped between the Safari, AL-Star, Vista, and CP1 models. In the mood for a stub instead of a fine nib? Just swap in a new nib. Super simple. The molded rubber, triangular grip fits my hand perfectly— even more so than the molded plastic grip on the Safari, AL-Star, and Vista models. A lot of folks shun those models because of that grip which forces you to hold the pen in a very specific way. The shape of the Nexx’s grip feels less severe and might work better for those who dislike the hard plastic grips on those other models. 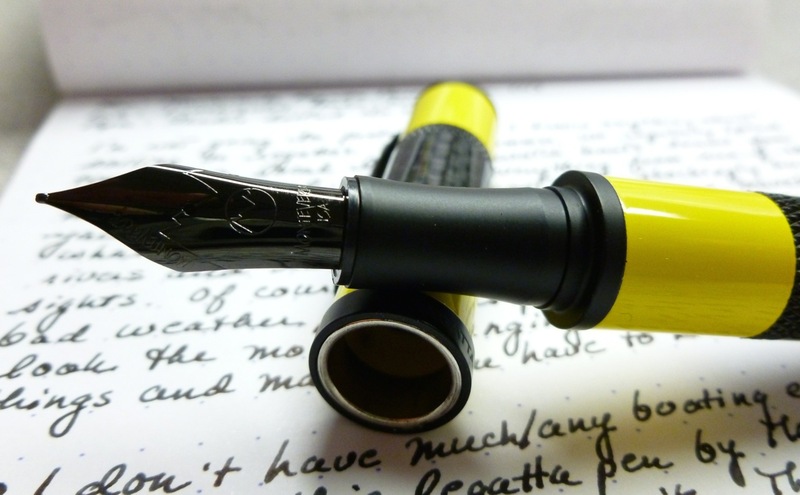 The rubber material means that it grips your fingers while you grip the pen. There’s just no slippage. The aluminum pen body starts out as a soft triangle that gradually transitions to a more rounded shape as it approaches the grip area. It’s a unique look and a fun detail. The Nexx is definitely lightweight— just 18 grams (12 g body, 6 g cap)— so it’s great for long writing sessions as there’s simply no chance of hand fatigue from holding a heavy pen. Despite its lack of heft, the Nexx feels durable and ready for anything your day throws at you (even a sprinkler head failure!). 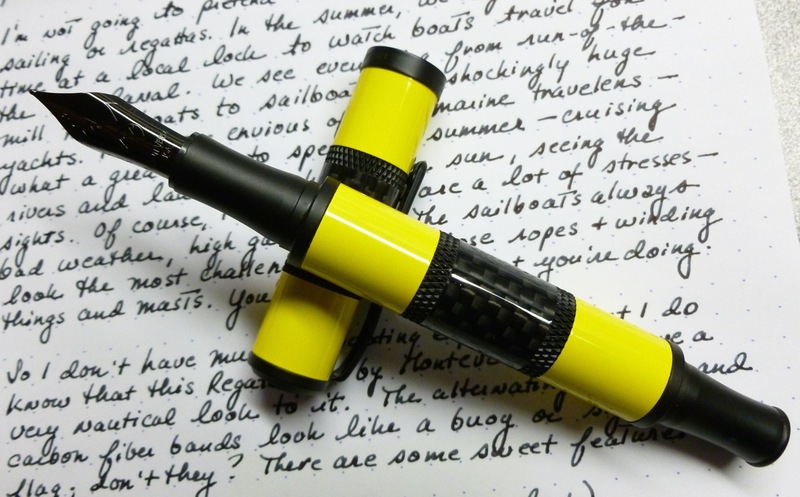 Made of aluminum, rubber, and plastic, this is a pen that can handle life’s hard knocks. The Nexx’s cap features a prominent aluminum clip and a lanyard loop that extends beyond the top of the cap. As much as I love my pens, I’ve never had the urge to wear one around my neck, but if you’re looking to do that, the Nexx is your pen. The clip is a bit stiff, but certainly usable. 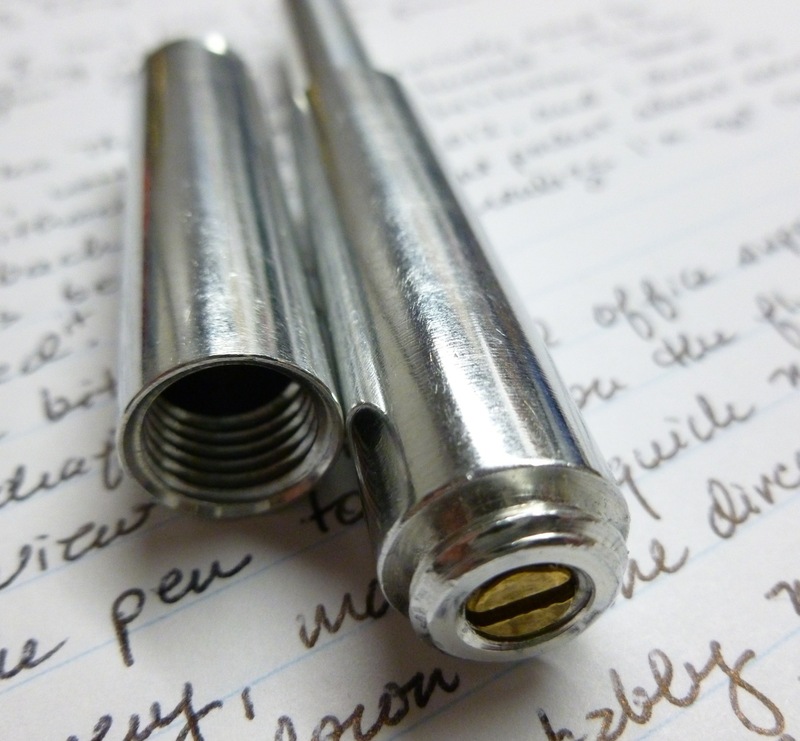 I routinely clip mine in one of my Nock Co. pen cases without a problem. The cap posts securely, despite the uniquely shaped barrel, and doesn’t wiggle off while in use (a pet peeve!). 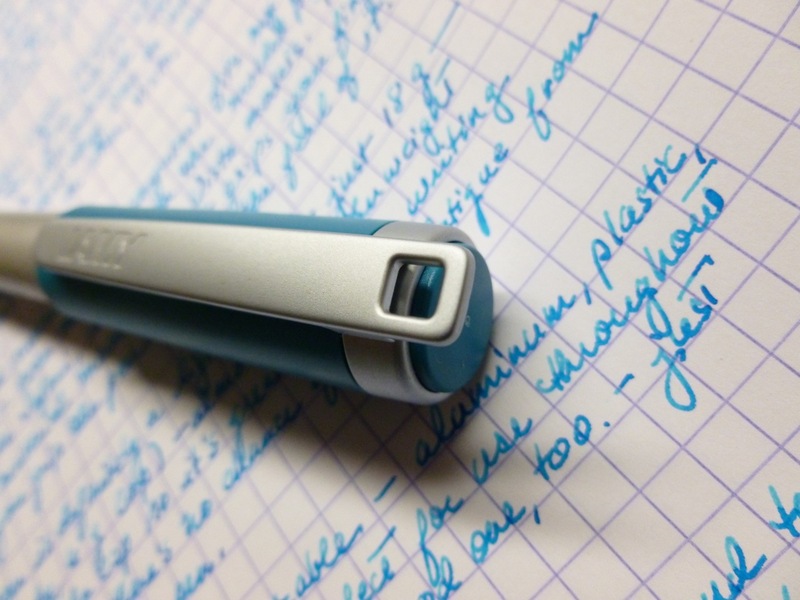 The Lamy Turquoise ink pairs perfectly with this pen. 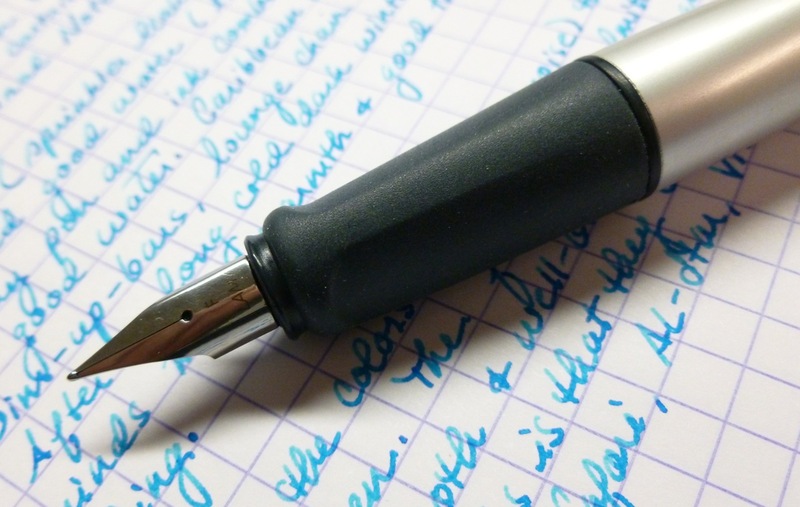 The color is fresh and vibrant and exhibits some nice shading, even with this fine nib. It really is a breath of fresh air in these gloomy end-of-winter days, and reminds me that azure summer skies and warm breezes will eventually get here. It is the color of hope. I’m chilled and chapped and a little bit cranky, but summer is coming. Summer is coming. Until then, I’m chasing those winter blues with this pen and ink prescription. 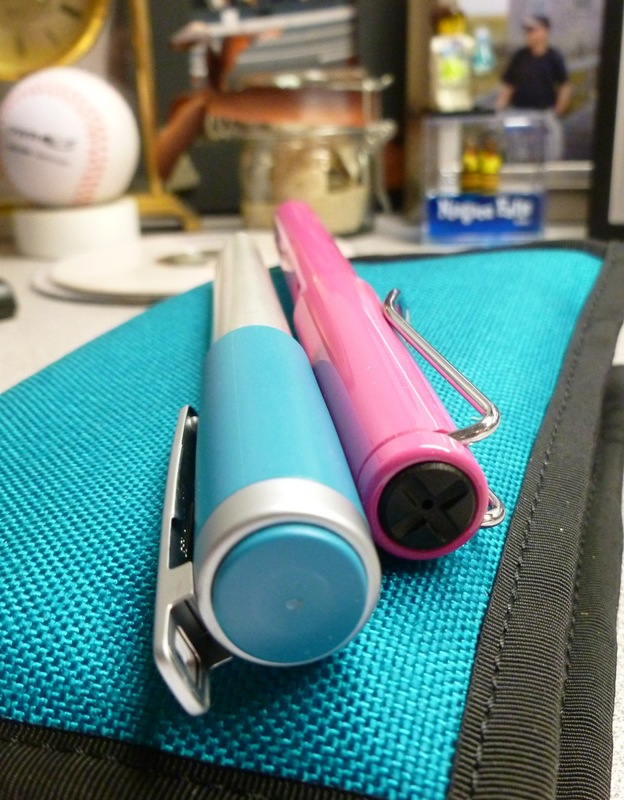 The Lamy Nexx Opal and Lamy Turquoise ink— a combination that’s good for what ails ya. 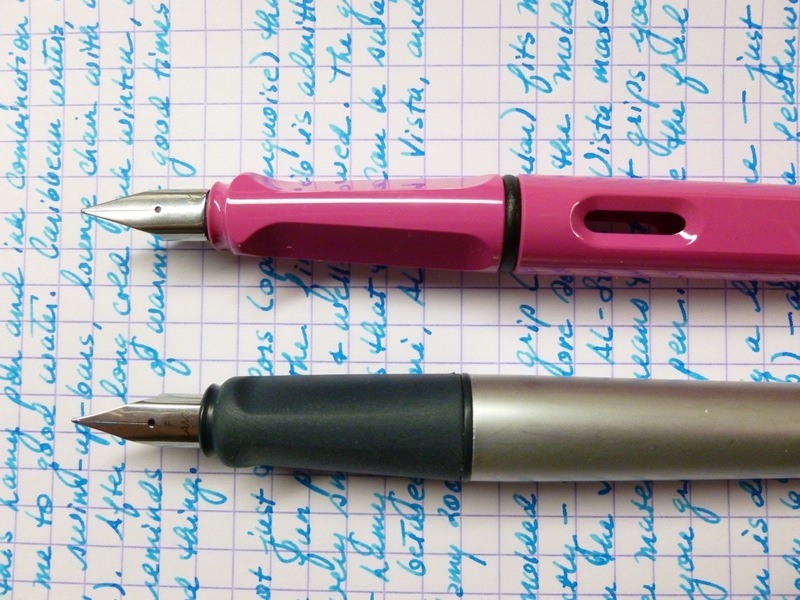 You can find both the Lamy Nexx fountain pen and Lamy Turquoise ink at JetPens. The pen retails for $30.50, while a pack of 5 cartridges sells for $3.75. (Free shipping on all orders over $25.) Thank you to JetPens for providing both for review. I’ve been thinking of revisiting some of the pens I reviewed in the past to see how my original opinions and experiences have held up. 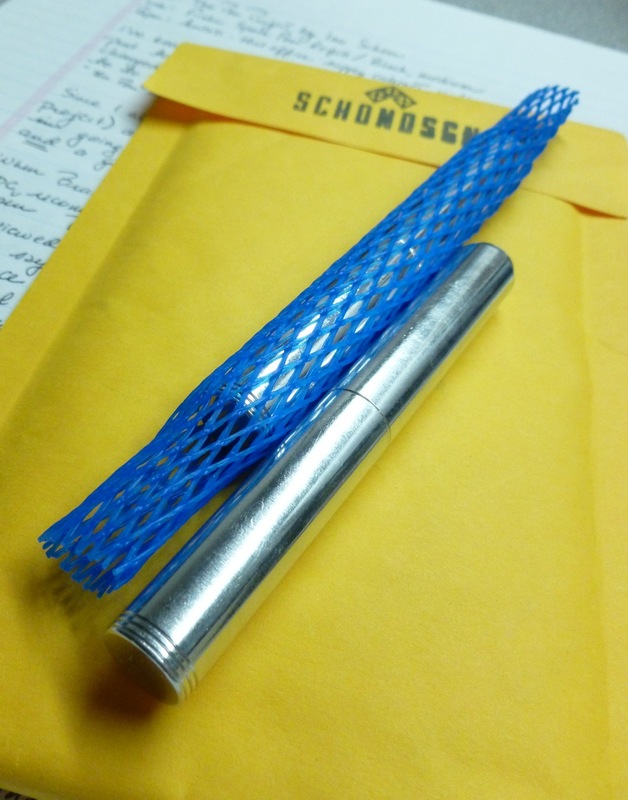 Ian Schon handed me the perfect opportunity to do just that by sending along one of his aluminum “The Pen Project” pens. When Brad Dowdy (Sir Pen Addict) recently asked for EDC pen recommendations, I tweeted “The Pen Project” without a moment’s hesitation. I reviewed this pen back in October 2012, and I think it’s safe to say that it’s been in my front pocket almost every day since I received it. And on the odd day when I forget to carry it, I feel a little bit undressed— like when I forget my watch or earrings. Shudder. I wrote the rough draft of this review in my sloppy, “just get it down” handwriting on plain old office supply cabinet paper because this is a pen primarily designed to be used on the fly— when you need to sign for a delivery, make a quick note in your pocket notebook, or jot down some directions. This pen shines in its ability to remain unobtrusive until you need it, then work without fail, thanks to the Fisher pressurized refill. I’m probably not going to sit down, pull out my best paper, and write a letter with this pen (the refill is quite good but not my hands down favorite), but for my “throughout the day” needs, it’s simply perfect. Aluminum (DSGN #0001)— $58.00; Machined and finished in small batches with a high level of precision and care from American sourced materials. These weigh 1 ounce. Black Anodized (DSGN #0001B)— $64.00; These aluminum pens are anodized by a local (MA) vendor and have a very uniform look and smooth feel. Titanium (DSGN #0001T)— $320.00; These are made from domestically sourced grade 5 titanium, which is precision machined and finished by hand. The set screws are made by one of the oldest screw manufacturers in Massachusetts and are hard gold plated. These weigh 1.8 ounce. LIMITED RUN of 200 pens. My original review, which includes details for changing the refill, etc., can be found HERE. The minimalist/timeless design, quality materials and workmanship, and perform-through-anything refill makes this my go-to EDC pen. That was true in 2012, and it’s still true now. Now for the fun part…the GIVEAWAY!! YOU can win one of Ian’s aluminum pens (DSGN #0001)!! Open to US and International readers! Leave ONE comment on this post—maybe tell me about YOUR favorite EDC tools. The contest closes on Wednesday March 19th at 11:59 pm. All names will be placed into a New England Patriots cap (these ARE Massachusetts born pens, after all), and my impartial husband will pick the winning name from the hat on Thursday March 20th. The winner will be contacted by email and will have one week to respond with a mailing address. In the event that there is no response within a week, a second name will be drawn from the same hat. May the EDC pen gods be with you! Ian Schon graciously donated the pen for this giveaway. 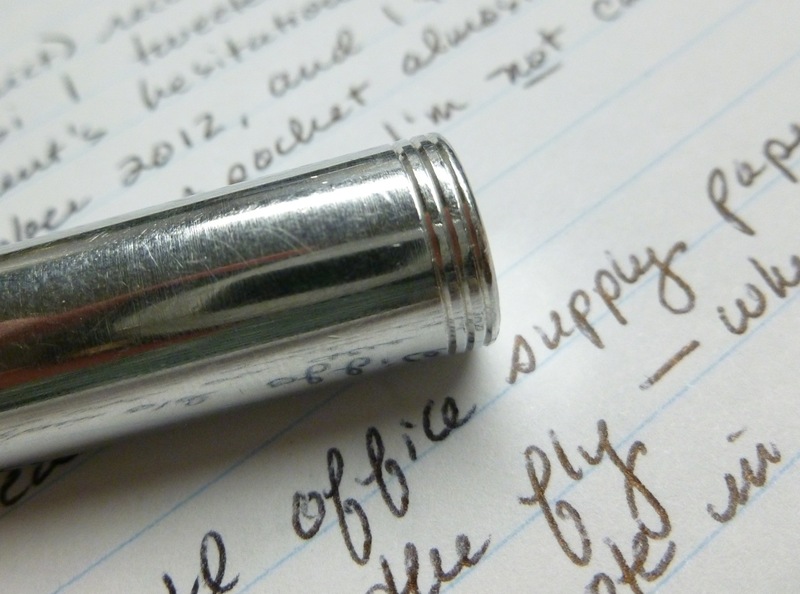 I was not compensated in any way, and this review reflects my own experiences with Ian’s pen. EDITED TO ADD: WINNER ANNOUNCED! I’ve contacted the winner by email. Should I not receive an address within one week, an alternate winner will be selected. 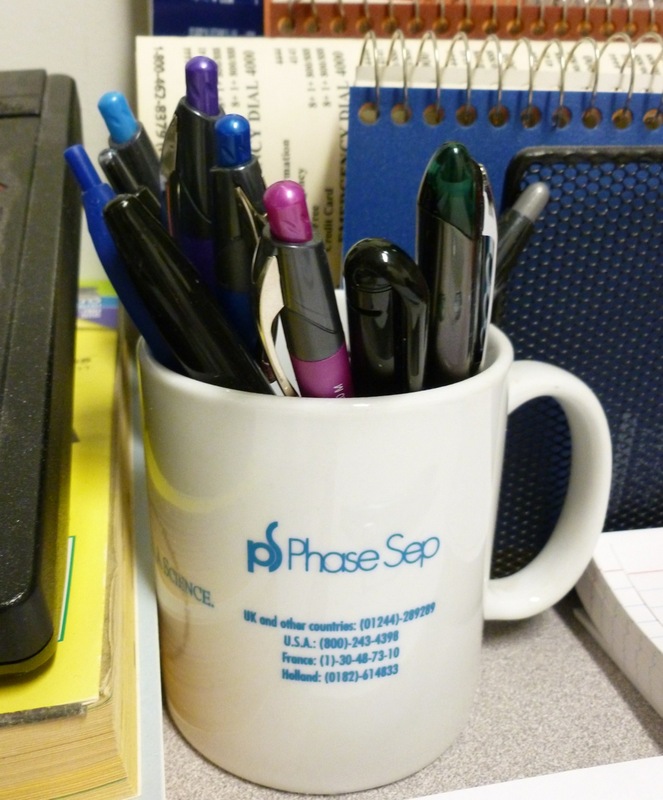 Looking around at the various pen cups in my office, I decided it was time to take action (quickly, before I changed my mind). 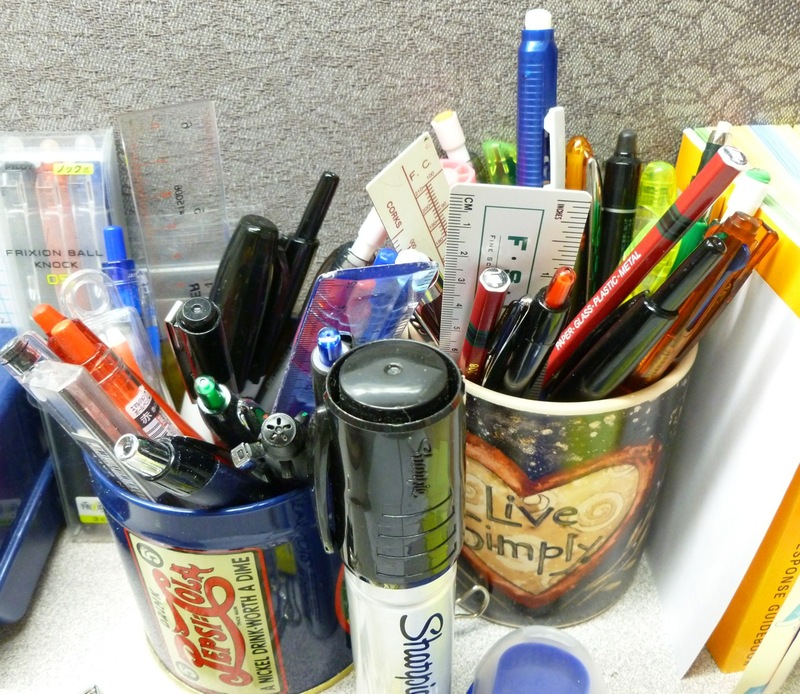 A pen living in a dusty mug is not a happy and healthy pen so I knew I needed to find them brand new homes. Luckily, because I work at a college, I have a steady flow of students who are thrilled to test-drive and adopt my cast-offs. 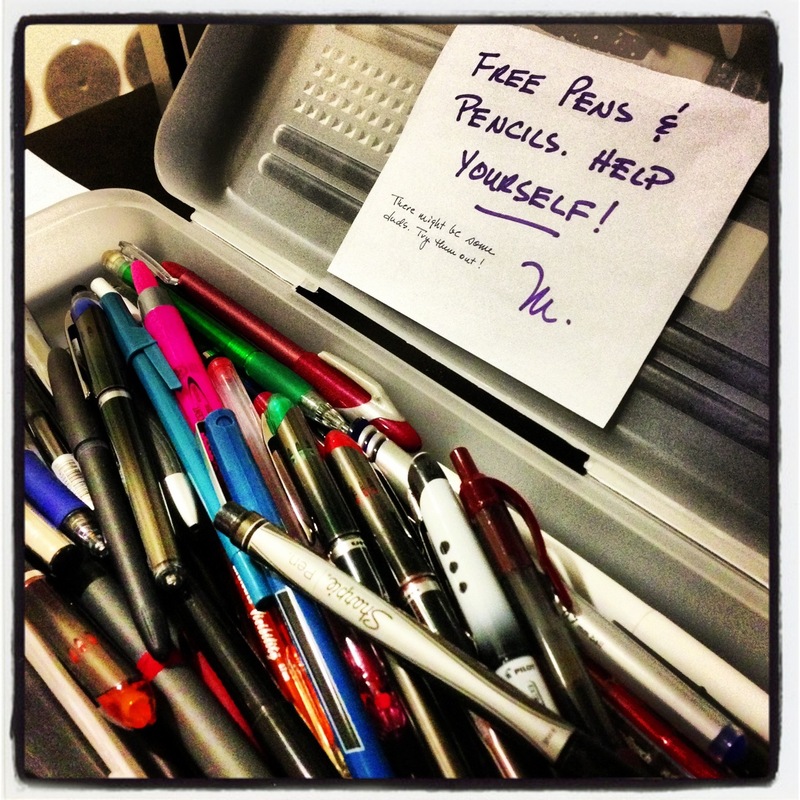 They’re amazed to be offered free pens and often admit to having a bit of a pen addiction themselves. So we bond a little bit as we discuss our particular likes and dislikes. 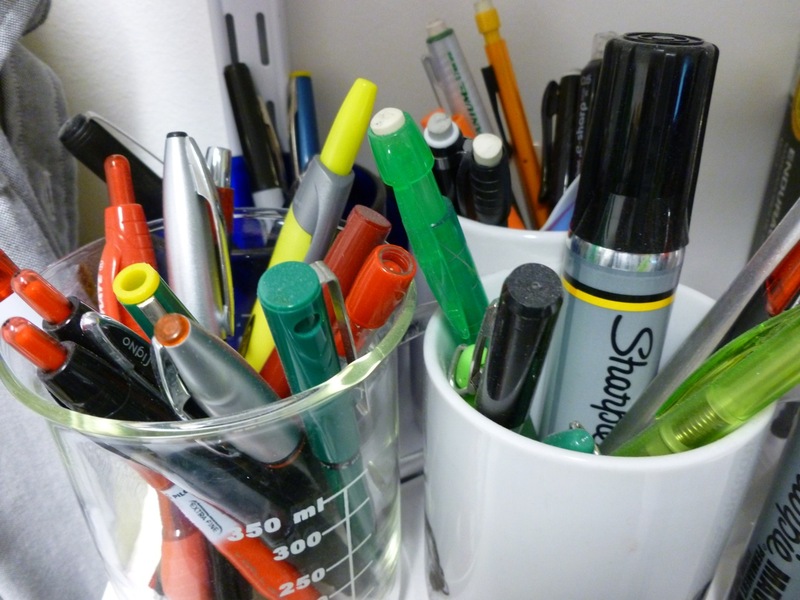 A few ask, “Why do you have so many pens?” I briefly explain that I have a clinical condition known as “hyperpenopathy”, which might be completely made up, yet very real. Before long, the pen herd has been thinned. It’s a bit like when vultures swoop in and pick a carcass clean, but in a good way. 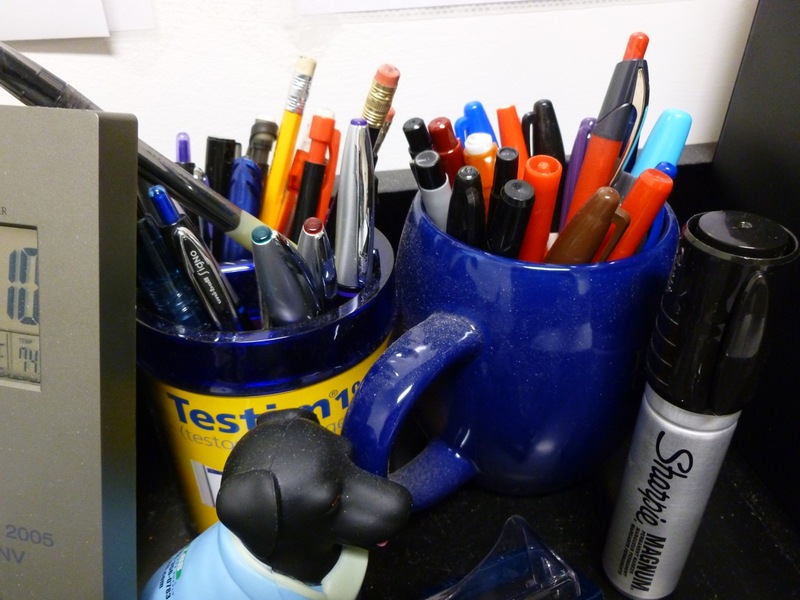 I’m happy to see my surplus pens and pencils put to good use before the ink has fossilized and the erasers turn to dust. It really is a win-win situation. Sometimes, though, I find MYSELF rooting through the pens I’VE JUST DECIDED TO GIVE AWAY, when one of them catches my eye. 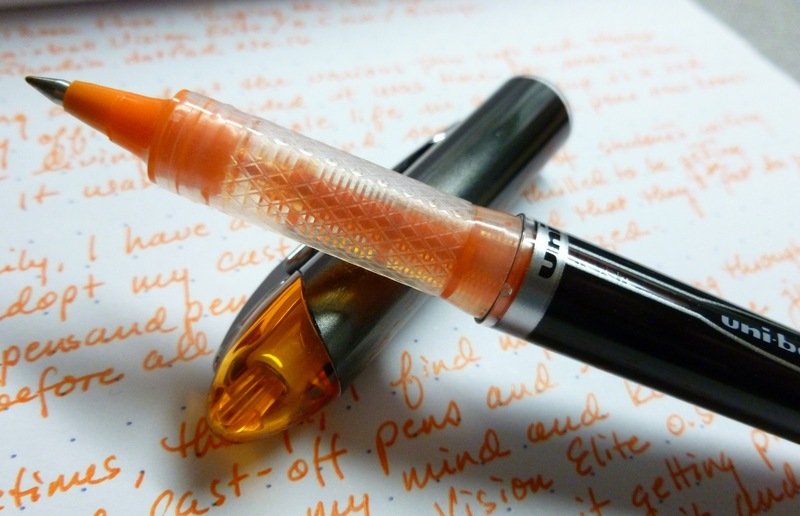 Such was the case with this uni-ball Vision Elite 0.5 mm orange rollerball. Something about seeing it get picked over made me want it back. So I snagged it, and have been using it ever since for jotting quick (orange) notes, and for checking off to-do list boxes. And, if you’re me, reclaim. 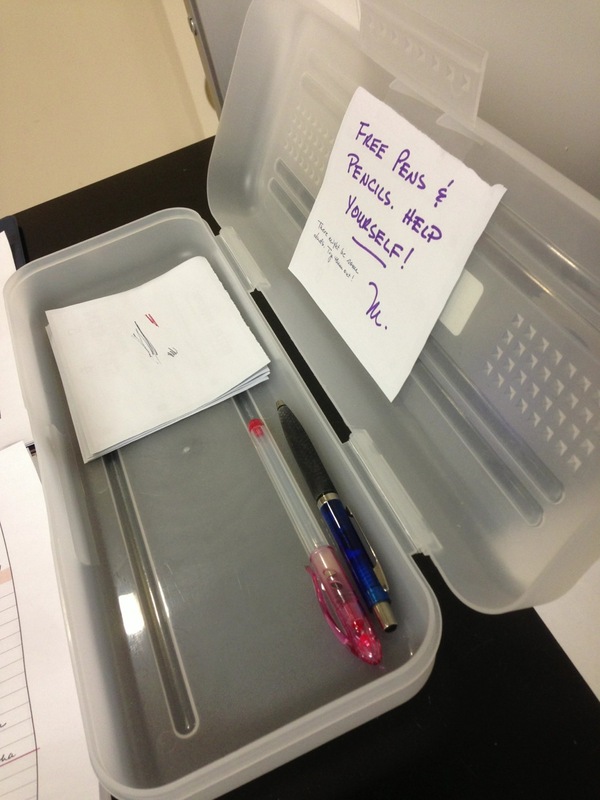 Do you ever give away pens? Do you trade with friends? [Hmmmm…maybe we should do this!] Do you donate to a favorite school or program? Do you set them free in the wild? I’d love to hear your stories in the comments.